Net Weight: 5 Pounds / 80 ounces / 2.27 kg. Other sizes available here. Please Note: The shipping option "USPS Priority Mail" is restricted for this item. Please select a different shipping method. 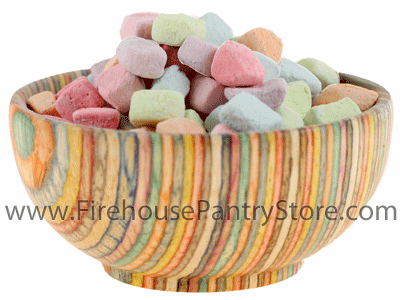 Please Also Note: These marshmallows, as they are dried and brittle, rub against each other during shipping and create some "marshmallow dust". Regardless of cushioning used in the shipment box, this issue cannot be avoided. There will be a small amount of "marshmallow dust" in the bag.